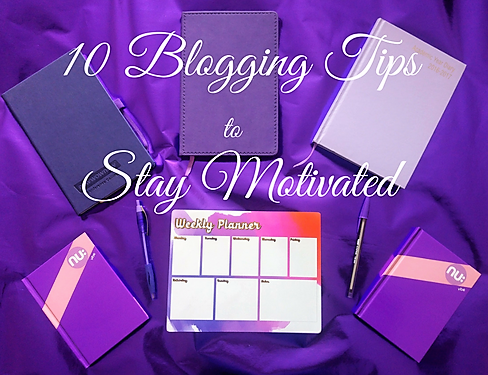 I’ve put together 10 blogging tips to stay motivated. We all get a little stuck at times and it can be so hard to keep yourself motivated. Remember everything you need to do on the blog can be stressful. With products to review, personal posts, keeping up with social media plus the real world getting in the way it’s easy to lose track. I am always complaining that I am slacking so I decided to try and keep myself motivated and last week it most definitely worked, I managed to post on 6 out of 7 days! 6!!! I usually struggle to get 3 done! So what changed? How did I manage it? Post it notes – Yes, that’s right those simple little pads of paper you can stick anywhere & everywhere! I have always loved post it notes and I have a few that have lines on for lists. I’ve been using these to note down all my account links, special days coming up (WMHAW17 etc.) as well as my weekly stats for each platform. Weekly Planners – It can be difficult to remember which products you’ve agreed to schedule for which days and trawling through emails can take hours. To save time & keep me on track I use these awesome weekly planners, which you can pick up in most pound shops, to jot down which posts need editing, scheduling, pictures uploaded & of course sharing across social media. This in itself has kept me on top much more than before! Notebooks – I love stationary, purple pens & notebooks make me way happier than they probably should but having a few notebooks handy has helped me jot down some ideas to go back to later. The Mr bought me a few different sized purple ones so now I have them EVERYWHERE! Set goals – We all set goals but how many of us keep to them or actively work towards them? Jotting down my stats each week lets me see which platforms I need to spend time on. I generally go up in 10’s, 50’s, 100’s then 1k for each goal. Seeing the difference each week helps me work out what I need to do more or less of on the blog & social media. Read other blogs – When I find myself stuck for something to write I often head to Stumble upon. I spend an hour or so flicking through a billion posts. Although it doesn’t always happen it usually gives me an idea of something to write about. Even finding new crochet stitches can be useful as I can write about them as I learn them. Take a break, Go for a walk – Ever sit at your desk and feel like your head is going to explode & you just can’t think? Take a break & do something else, maybe go for a walk. Sometimes we waste too much time stressing about what we need to do. Stepping away gives you a chance to think without feeling pressured to do so. Sometimes just going for a walk can give you ideas. Take your phone/camera too as you never know what you will come across. Chat to other bloggers – Sometimes running ideas past another blogger can be so helpful! General chats can lead to ideas for posts. Tracey from Hooks & Dragons recently struggled to remember which WordPress plugins she needed to use after buying her domain. I realised it’s something I had no clue about when I began. Sharing My Top 10 WordPress Plugins I helped Tracey & other bloggers find useful plugins they didn’t know about. Chat to friends & family – Whilst they might not know about or understand blogging sometimes the best ideas can come from those around you. A lot of my ideas come from talking to the Mr, the girls, my brother & friends like Mike (Slim to me) from Keep it Mike who I introduced to blogging before he went off on his travels last year. Clean workspace – Having a clean workspace can make the world of difference! If your desk is cluttered your mind probably feel’s that way too. If you can’t find paperwork or samples you need because they are buried it can get pretty stressful. I keep clearing my desk as I find if it’s cluttered I tend not to sit & do much at all. If it’s clear I enjoy sitting at my desk & get so much more done.. even with my granny squares taking up some space haha! Use time saving apps – IFTTT is an absolutely amazing app Martyn from Inside Martyn’s thoughts passed on to me. It allows you to link social media accounts. Say I share a picture via Instagram, I have it linked so that it then shares to my Facebook & twitter too. I use Buffer too to schedule tweets/posts across the day. This frees up time leaving me free to write or chat with others on social media. What do you think of my 10 blogging tips? Do you have any tips for keeping motivated?